The OCS says its deliveries are back on track after a series of delays. (Submitted: Ontario Cannabis Store) After several weeks of delays, the Ontario Cannabis Store (OCS) says customers can expect to get their hands on their pot products very soon. Since the OCS launched on Oct. 17, the firm says say it received over 220,000 orders, with the backlog prompting several complaints from customers who say they never got their products. OCS also blames the delay on labelling issues and rotating walkouts by Canada Post employees. 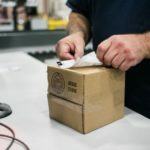 Since legalization, customers complained of automatic cancellations of orders and lack of communication with shipping estimates. But now the online distributor says it’s finally all caught up. "The OCS appreciates customers’ patience over the last few weeks as we worked collaboratively with licensed producers to resolve the initial challenges of launching a new business," said Patrick Ford, OCS president and chief executive officer, in a written statement Monday. The store says customers can expect their cannabis products to arrive in the mail within one to three business days.